Tom Harper does it again, with another excellent book that keeps you guessing and nervous all the way through. As with his previous book, THE LAZARUS VAULT, this novel is written as a time-split, with alternate chapters focusing on either the modern day or life in the Constantine-era in ancient Rome. Luckily, the chapters are quite short, so you can race through them and find out what is going on in the other time frame quite quickly. Harper is very good at ending a chapter on a cliff hanger - so it is very difficult to find a suitable spot when you can put the book down! In brief, the modern-day chapters deal with Abby Cormac and her race to discover the truth after her lover is brutally murdered in front of her. The story takes place in the Balkans and has her travelling throughout Europe, to Rome, London, and former Eastern bloc countries, in her search for answers. What she discovers is worse than her worst nightmare and when she ends up being distrusted and chased by her very own employers one begins to wonder if her life will ever be the same again. In Ancient Rome, the story is told by Gaius Valerius Maximus and takes the form of him reflecting upon his former life as trusted aide and life-long friend of the emperor Constantine. He ponders upon the way he was asked to solve the violent murder of a Christian bishop, Alexander, and everything that happens to him after that. He muses to himself as he waits for the assassins that he is sure are coming for him and seems ready to accept his fate. The way the two stories fit together is simply a stroke of genius. It is not so easy to figure out what the connection is, but once you do work it out, you end up reading faster to check that you are right. The superb twist at the end, though, means that you might be right but this, in fact, is highly unlikely. 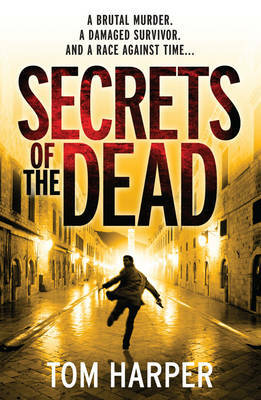 Well-written and fast-paced, THE SECRETS OF THE DEAD is another excellent offering from Tom Harper. At the end of the book there is an excellent commentary on the historical accuracy of the Roman history chapters. What makes this book even more worthy of praise is the fact that almost all of the Roman characters, and their lives, are portrayed as accurately as possible, so you learn something new as well as having a good read to enjoy. Very highly recommended. Next please, Mr. Harper!